If you are looking for a quality handicap shower, you have come to the right place. Aging Safely only sells the finest wheelchair accessible showers on the market today. This uniquely designed shower is manufactured in the United States and comes with an industry leading 30 year manufacturer’s warranty. Not only are these roll in showers incredibly durable, but they are equally as functional. Customers can customize the handicap shower system to their particular needs and likings. The 48” x 34” model is compact and can be professionally installed into most residential locations. Custom colors and tile patterns available upon request. Would you prefer a larger 30” x 60” Roll in shower. 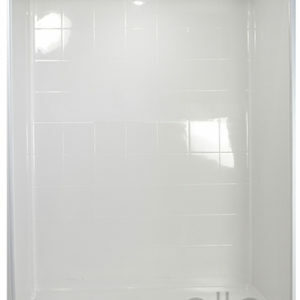 Strong, luxurious polyester gelcoat composite fiberglass tub shower with “RealTile” finish. Full plywood backing on all walls for outstanding strength. Easy, snap-in-place installation from the front. Please contact an Aging Safely representative for additional sizes not listed in this website.